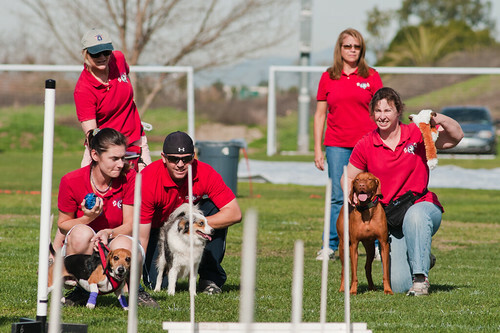 When it comes to dog sports there’s nothing like Flyball. For one thing, no other dog sport involves teamwork like this sport. Yes, it is noisy and there is constant activity at practice and at the tournaments. The noise however, is the enjoyment that the dogs are having as they play this relay game. 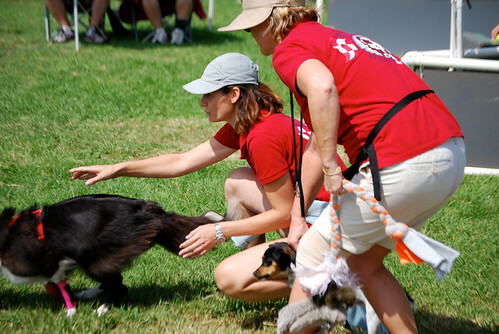 Flyball is a cross between drag racing and relay racing. The start dog and handler use a drag strip style light set up as a release mechanism. Dogs from the same team pass each other with split second precision. This doesn’t happen by accident, it is with countless hours of practice and expertise that this all takes place. One the best things about Flyball are that in a matter of months a handler and dog can be racing. This is not to say they are earning titles their first time out, but they are actively engaged in the sport and participating on a team early on. It does happen quite often however, when a first time participant will do well and earn a title. Not all dogs learn in a matter of months though. Some take a year or even longer but the fruits of their labor pay off big time. When you and your team are at the start line and the light turns green for the start dog to cross the line, everybody is cheering, yelling, and the adrenaline is really flowing. All the dogs are hyped up and so are the handlers. It’s an unbelievable feeling which you just have to experience since a description of the situation doesn’t give it justice. 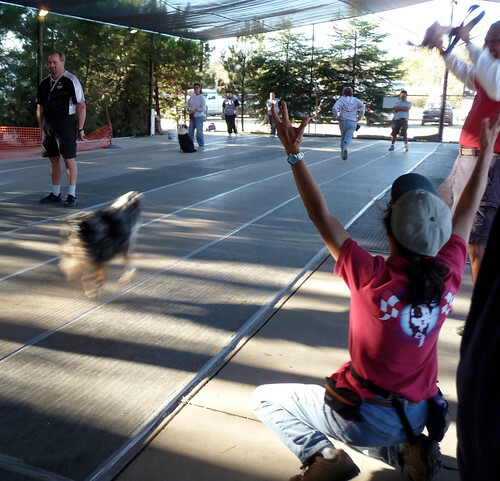 Fortunately, there are other times in flyball racing where there is very little or no tension. 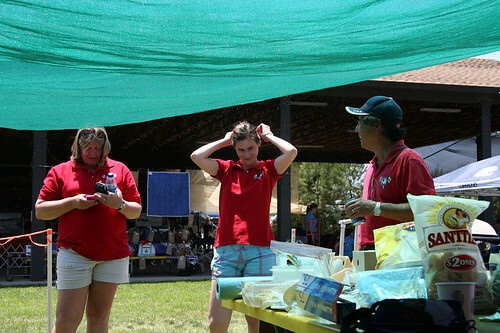 One very nice aspect of Flyball is the camping portion of the sport. I know what you’re thinking. 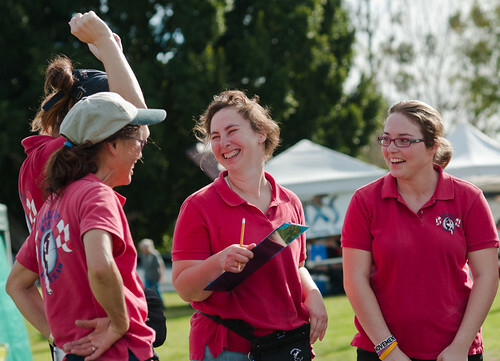 What does camping have to do with Flyball? At each tournament we have to set up a camp for our team. This is no small chore, especially since we spend two days at the site racing which is the entire weekend. As team captains, we have to stake out our claim usually a day in advance. Even when we race out of town we stake out our campsite the night before racing. Our camp consists of 7 to 10 canopies, a dozen chairs, a dozen dog crates and x-pens, a couple of tables, twelve to twenty people, and 15 to 20 dogs. Oh yeah, I almost forgot about our most important item, the barbecue! So on tournament weekends when we race, we also barbecue, camp and have so much fun with our dogs and team members it’s hard to imagine. 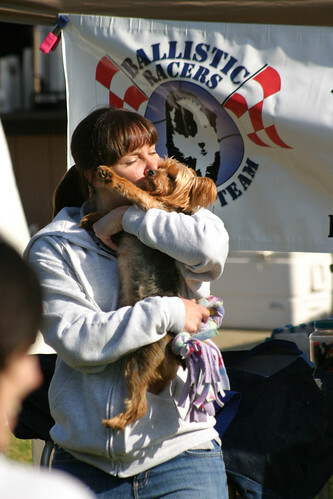 Believe it or not, the Flyball Team becomes part of your extended family. You spend a weekend every other month at a tournament and a least one day per week practicing with them. In addition to this, we do demonstrations several times per year for public events and have an occasional get together such as our annual Christmas Party. The important part of this sport is that you and your dog spend quality time together, make new friends, and have a wonderful life doing something you and your pooch really like to do.